[Blu-Ray Audio/JAPAN] SONNY ROLLINS - Saxophone Colossus (OOP/NM) Pure Audio! 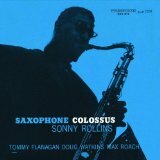 Saxophone Colossus is ranked as the best album by Sonny Rollins. Members who like this album also like: Kind Of Blue by Miles Davis, Mingus Ah Um by Charles Mingus and Time Out by The Dave Brubeck Quartet. Related links: top tracks by Sonny Rollinstop tracks of the 1950s, top tracks of 1956. Showing latest 5 ratings for this album. | Show all 277 ratings for this album. Great hard bop album. I love the speed and energy present in most tracks. Great solos from all 4 musicians throughout. St. Thomas stands out particularly with it great groove. Rollins is an exceptional blower and this is his most outstanding outing. Challenging yet melodic in composition, full of excellent improvisation, and while Sonny is the star, all members of the ensemble contribute to make this whole greater than the sum of its parts and cement this as one of the all time great jazz albums. Another of the great jazz albums of the period. I still can't make up my mind whether it's my favourite Sonny Rollins album, but it's certainly in my top three. Yes, the drumming is great, and I would take a sax soloist over any brass. This album is noted for its melody-based improvisations. Rollins reinvented the melody in jazz around an overriding theme. The overall sound is as refined as the compositions are sophisticated. Rollins distinctive saxophone style seems to embody all of the classic traditions of jazz whilst simultaneously merging them with the avantegarde. Max Roache's drumming is thrilling. wow. very cool. This album makes me want to look further into jazz.